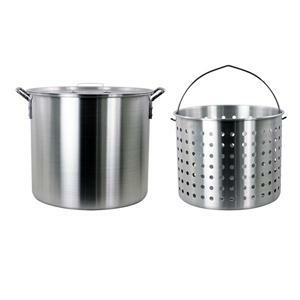 The Chard 42-quart sturdy aluminum stock pot is designed to handle all your big cooking needs. It comes complete with a handy strainer basket and lid and promises years and years of durable use. With Chard's uncompromising quality, it's the last stock pot you'll ever have to buy! In Box: stockpot, strainer basket & lid. Aluminum.